I first discovered the Elf on the Shelf a year ago at a local Holiday Craft sale and thought it was the cutest idea! 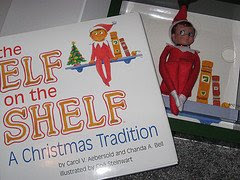 Basically you start a Christmas tradition for your family by reading the book which introduces the elf as 'Santa's helper' who will be reporting back to Santa each night while the kids are sleeping to see if they've been good or bad. The family can name the elf and make up your own rules. Each morning whent the kids wake up they have to 'find' the elf in a new location. Such a cute idea! !